Two enterprising mums have turned their frustration at being unable to find a unique party venue for their daughters into a business and have opened a kid's day spa. Susan Smith and her sister-in-law Lisa Feely have six children between them and were frustrated when it came to planning parties for their daughters who are six and ten. "It was party time and we were looking around to see what's out there but they had kind of done everything," Susan told Independent.ie. "We just said there is no space where little girls to go to to have a party. What's unique about our offering is that there is a venue you could go to," Susan said. "We did a lot of research, to see what was already on the market, we spoke to other mums and it basically grew legs from there." Fabulosity Kids Day Spa in Terenure Business Park opened last Sunday and are already taking bookings for March 2018. While the idea of a 'spa' for children might not be suited to everyone Susan said they have placed a huge focus on creativity with arts and crafts, books and dress up playing a big role in the parties. "You have to respect it's not going to be for everybody but it's not a total pamper party. It's all about creativity, letting them hang out together and having fun with their friends in a safe environment. It's really bright, we put a lot of effort into making it nice and fun. "There's always going to be people who it's not for them or they don't want their children to have their nails painted and that's fine but there are an awful lot of people who do want it and it's harmless fun," she said. The two businesswomen worked in very different fields prior to going into business together, Susan worked in financial services for a decade, while Lisa worked in Microsoft before opening an online children's book store. "I think our skill sets are quite blended and we compliment each other... but it's a far cry from children's parties," Susan said. Due to the volume of bookings the business has already accumulated the pair are now looking to recruit staff and build a small team. "We couldn't have foreseen how big it was going to be," Susan said. The first two parties at the spa went down a treat Susan said. The offering is a two hour party with pink lemonade, treatments including a footspa, glitter tattoo, hairstyles and nail painting and a disco. "We have a huge big arts and crafts area so that's where they base themselves and the stuff they make is amazing,"
For the tea-party there is a spread of healthy foods including hummus, fruit kebabs and strawberries which Susan said was something they were keen to see as mums themselves. "It's just really taken off, we are a bit stunned by the whole thing at this stage. We didn't expect it to go this mental so quickly," she said. 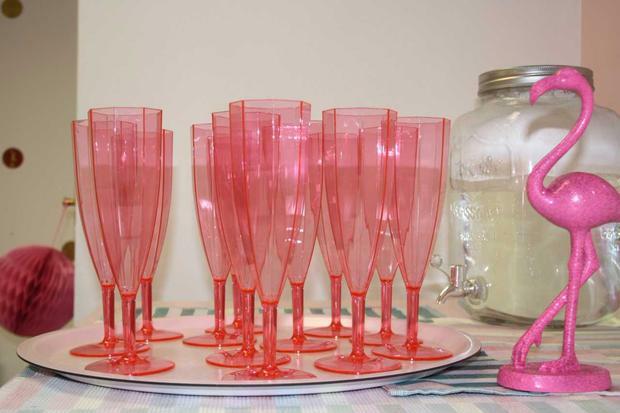 "Some of the mums were suggesting swapping out the pink lemonade for Prosecco and doing something with mums," Susan said. More information can be found on the company's website www.fabulosityparties.ie.